Close on the heels of winning the Greater Phoenix Chamber’s Impact Innovator award, Equality Health, the Arizona-based organization pioneering healthcare delivery to underserved and diverse populations, has also just been named Business of the Year by the chamber in the small-to-medium business category. 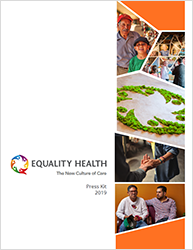 Equality Health, an Arizona-based organization pioneering health care delivery to underserved and diverse populations, announced it has appointed Dr. Jacque Sokolov and J.P. Millon to its 2018 Strategic Advisory Board. Sokolov and Millon join a respected team of national and local experts from a broad range of health care sectors and community leaders in aiding Equality Health with strategic development, market insights and consulting. The Greater Phoenix Chamber of Commerce (GPCC) has selected Equality Health as its “2018 Exceptional Innovator” in the small-to-medium business category for its 31st Annual IMPACT Awards. Phoenix Rising Football Club announced today that Equality Health, a culturally-focused health care delivery system in Arizona, will be the official presenting sponsor for the 2018 season. Equality Health, an Arizona-based organization pioneering integrated health care delivery to underserved and ethnically diverse populations, has added industry expert Lisa Stevens Anderson to its executive team as Chief Operating Officer of Q Point Health. Stevens Anderson will leverage her previous experience leading Banner Health’s successful ACO in her role overseeing Equality Health’s growing roster of value-based contracts. Equality Health selected as “2018 Exceptional Innovator” by the Greater Phoenix Chamber of Commerce at its 31st Annual IMPACT Awards. Equality Health selected as “2018 IMPACT Business of the Year” by the Greater Phoenix Chamber of Commerce at its IMPACT Awards.